For Magic Mondays this week we give you an array that will protect you even in the most direst of circumstances. This week we show you the Shadow Valley array. Notation: Exclude Light and Sound from all Humans within an area 10 – 100 times larger than the array’s size. Description: A nomadic tribe in the Western deserts have a sacred hymn that assures them that no matter the trials and tribulations and oppressions, that no matter how dark and shadowed the valley be through which they walk, their god will be with them to comfort and protect them. It seems a footman in Middelburg had been quite taken by this hymn when he created this array, although whether he designed it because of the comfort the hymn brought him or because of sheer sacrilegious irony we will never know. Just as the hymn says, this array will protect you while you walk through a shadowed valley, surrounded on all sides by confusion and misery… even though that confusion and misery is entirely and utterly your fault. What the Shadow Valley does is blind and deafen everyone around you while keeping you immune from the effect. The purpose, of course, is to confuse and disable your opponents while you do what needs to be done. It does this through two points of runecraft every good runescribe should be aware of. Firstly, by using the secondary array to create the effect of a containment field that excludes light and sound and then applying this entire effect to all humans in range. This means that the containment field is equally applied to all bits of a human that it can reach. This means that every exposed piece of skin will become a focus point for the containment field. Since the containment field excludes light and sound, it means that no light or sound will be able to breach a human’s outer layer, effectively blinding, deafening and muting every human in range. 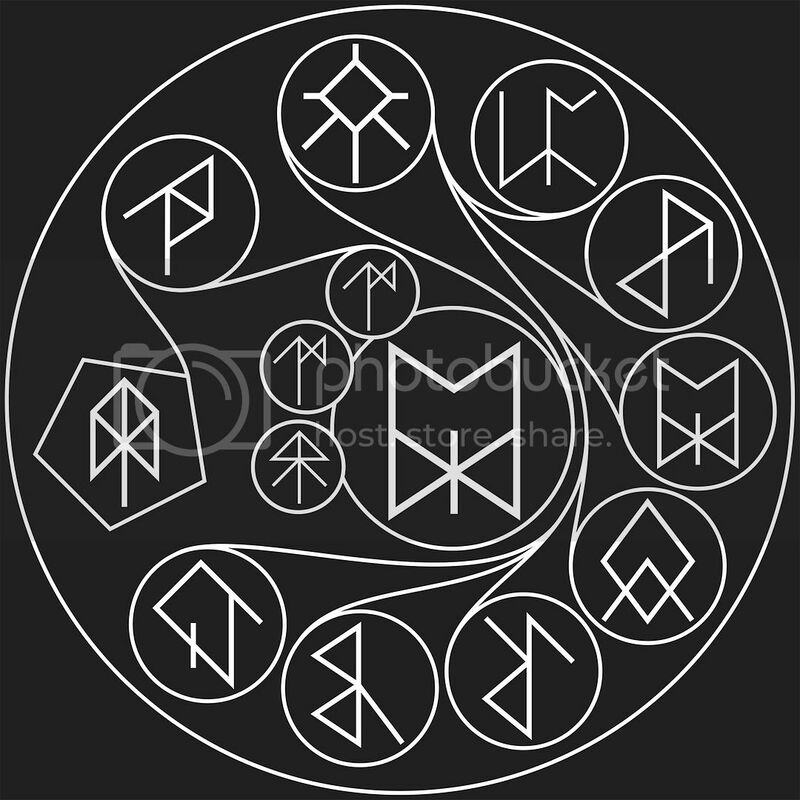 It excludes the person bearing the array by using an “exclusionary modification” on the Contain rune, thereby excluding the first 10-times-the-array’s-size area from the effect, but since there is a Gargantuan rune on the same Contain rune, the effect is still spread out to a 100 times the array’s size. This is the second way that you can create a doughnut shaped field of effect to spare the bearer of the array the effects of it. 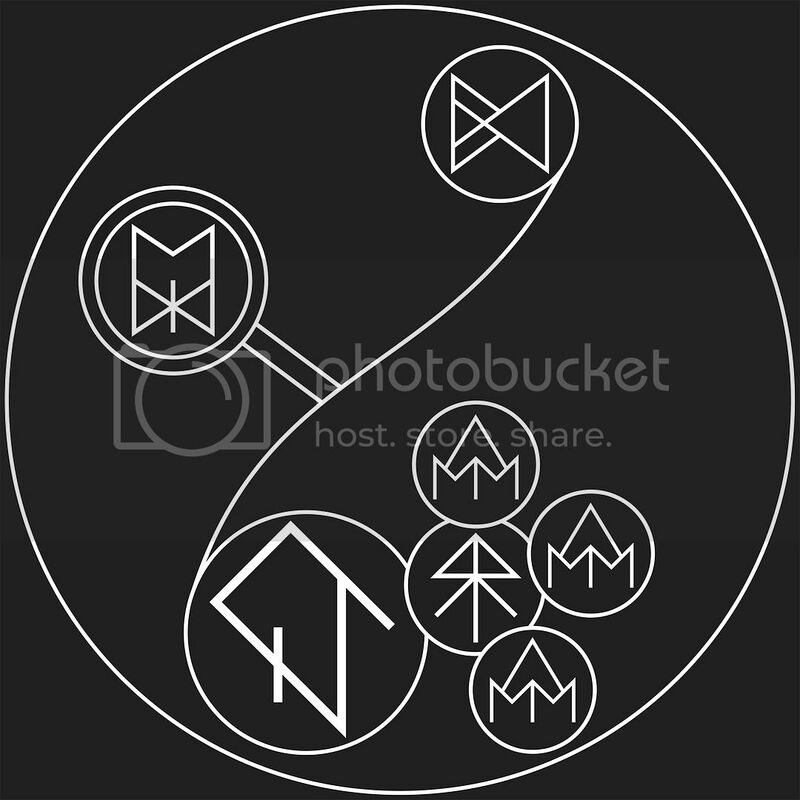 The first way is to use a Shell rune such as in the Invisible Chaos array and modifying its size to what you want. Both methods give the same effect, so it is up the designer to choose what he wants. Now to how it is put into practice. As with most footman arrays, this array is inscribed upon a disk 10 cm in diameter, meaning the shadow effects start a meter out and ends 10 meters out. However, if you leave it at that, you will only be blinding, muting and deafening everything at and above the level of the array. What you want to do is inscribe this array on both sides of the disk so that no matter where a person is, no matter the altitude, they will be caught up in the array’s effects. And with all of that done, you can safely steal, burgle and murder to your heart’s content. 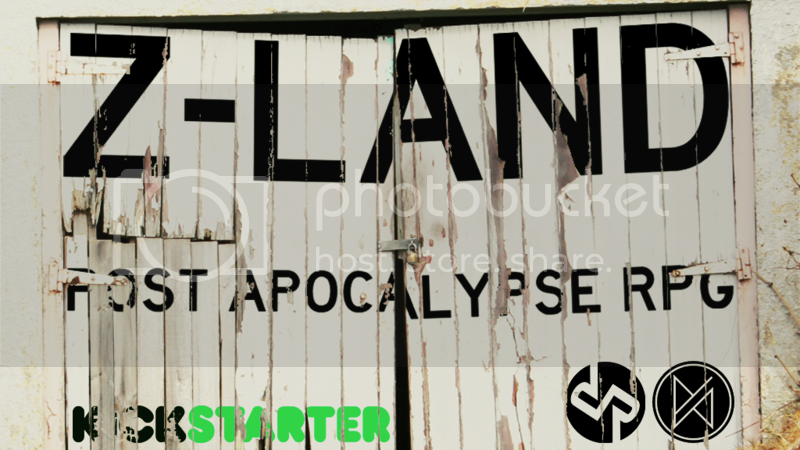 We’ve hit the 90% mark in our Kickstarter Campaign! We’ve only got 11 days left to go so now it’s the final push towards victory! Click the image above and help us get to 100%! Sometimes it’s not about the weapon used or the enemy fought; sometimes it’s just about sending a message. This week we show you the Hellish Rebuke array. Notation: Transmute, within an area 100 times greater than the array, Humans into Wood if Human Blood is present and apply the effect of a Created and Sustained Fire to Wood. Description: At a quick glance, you might be forgiven for mistaken this array for the Sculptor. They both work in a fairly similar fashion and, unbeknown to most, they have share an origin in the old Western Neoist Empire. However, where the Sculptor was used to immortalise their emperors in stone, the Hellish Rebuke was used for its worse criminals. In the Neoist faith, there is a specific punishment in the afterlife meted out to each type of sinner. For the violent and murderous among us, their punishment was to be turned into an olive tree and set alight for all eternity. The supposed irony of this punishment has been lost over the centuries, but not the method, and while there is no rune for olive trees, a simple wood rune suffices. From that time, and even today in the smaller towns and far flung villages, the Kaíns (the Neoist priests and judges) would use the Hellish Rebuke on the murderers in their midst. The array transmutes the human into wood before setting him on fire, and so it is completely painless. This is hardly a cruel punishment, and it was never meant as such. The Hellish Rebuke is not meant for the condemned prisoner, but for the audience instead. This means of execution is a warning to those watching, a vision of what awaits them in the afterlife should they too follow down the violent path. By the time the fire has completely consumed the wooden statue, the message has sunk deeply into the minds of the audience and for a while at least the towns and villages would be free of crime. For a while. In Middelburg, however, no amount of dire warnings and extravagant means of execution can stop crime. It’s as much a part of the grand city as the bricks in its buildings. But it does serve well as a warning not to enter an area. Rather than a vision of eternal punishment, the Hellish Rebuke has become a grisly scarecrow used by the gangs of Middelburg to mark their territory. The few Neoists in the city has taken great umbrage at this, but the few who have tried to intervene merely became another burning effigy to the gangs’ bloodlust. Even the footmen, ever practical as can be, have taken a liking to the Hellish Rebuke. Not as any sort of warning, be it territorial or eternal, but for the sheer shock value. Working in the dark as they often do, having a comrade suddenly become a burning wooden statue would go a long way to demoralise you, and the sudden bright fire would expose your position and reveal you to your enemies. All in all, being on the receiving end of a musket round engraved with this array is not a terribly good thing. The one doing the shooting, however, would be more than cheerful at seeing his results. Want to put your arrays to good use? 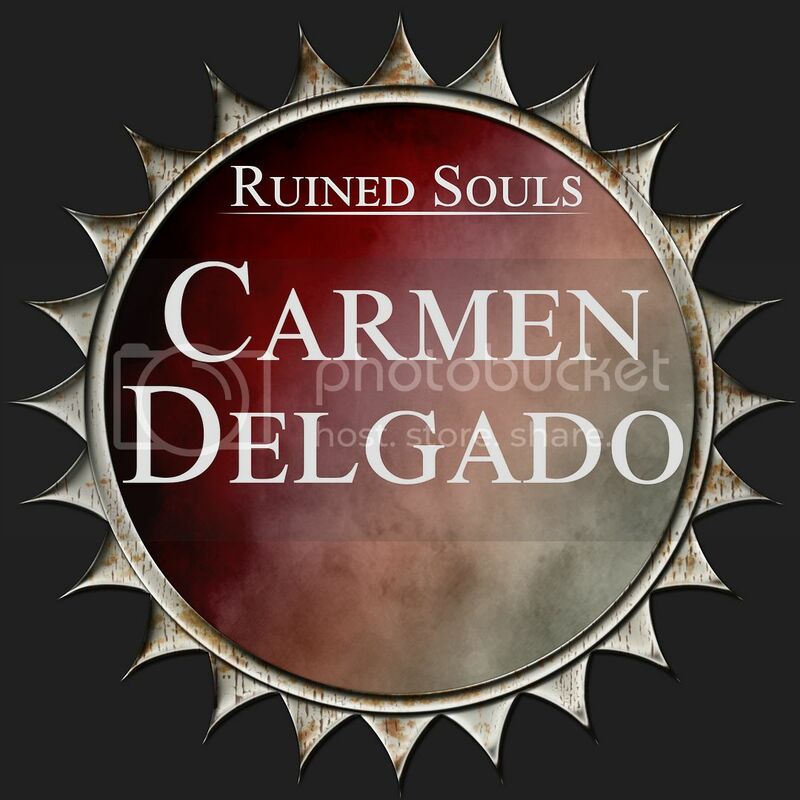 Use them in The Ruined People, the new campaign book released just this month. Click the image above and see what the arrays can do in the grand city of Middelburg. For Magic Mondays today we give you the power over life and death, but dare you use it? This week we show you the Dark Folly array. Notation: Contain Human and apply the effect of Inverted Time. Description: Conquest is no easy thing. The Westerners and Bythikans trying to colonise the southern continent have quickly found that out, while the Caels and Tolians have long since known that fact when dealing with the Uttosians. In a world where every man has access to the power of the gods, conquest and colonisation is a struggle at the best of days. When the Westerners discovered the southern continent they thought to find simple savages that they could do away with in a day or two. What they found instead were legions of the undead armed and armoured with the arrays and ready to fight. They may not have had the muskets and cannons of the Westerners and Bythikans, but they had the power of death itself. And so for near on a century, Death and Conquest have waged war. The Dark Folly is one of the few arrays brought back to the continent exactly as the dark southerners designed it. 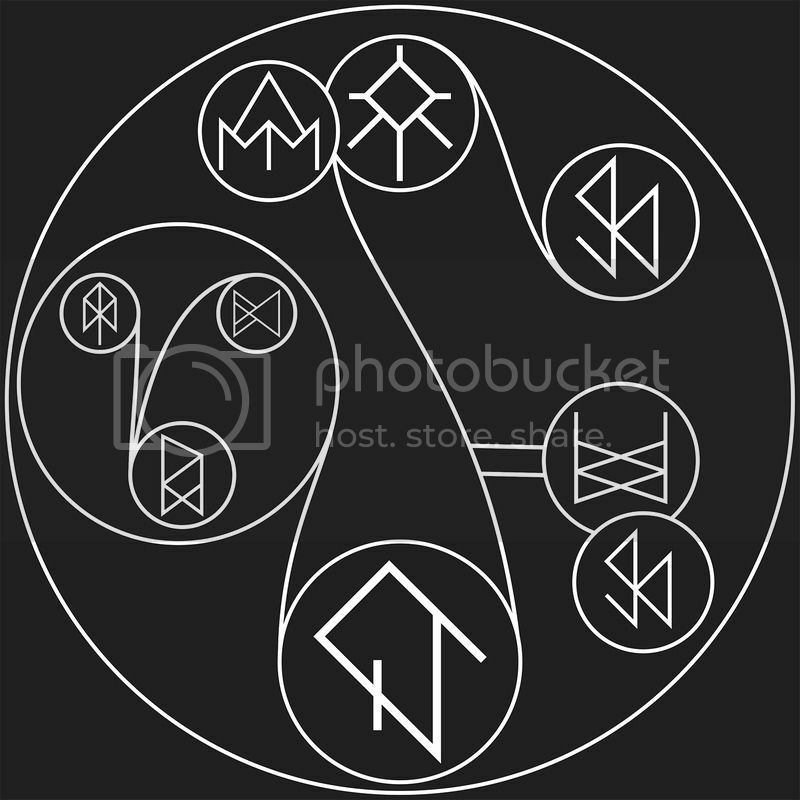 It was also the first array that gave the Jytohans the clue as to what the Invert rune actually did. 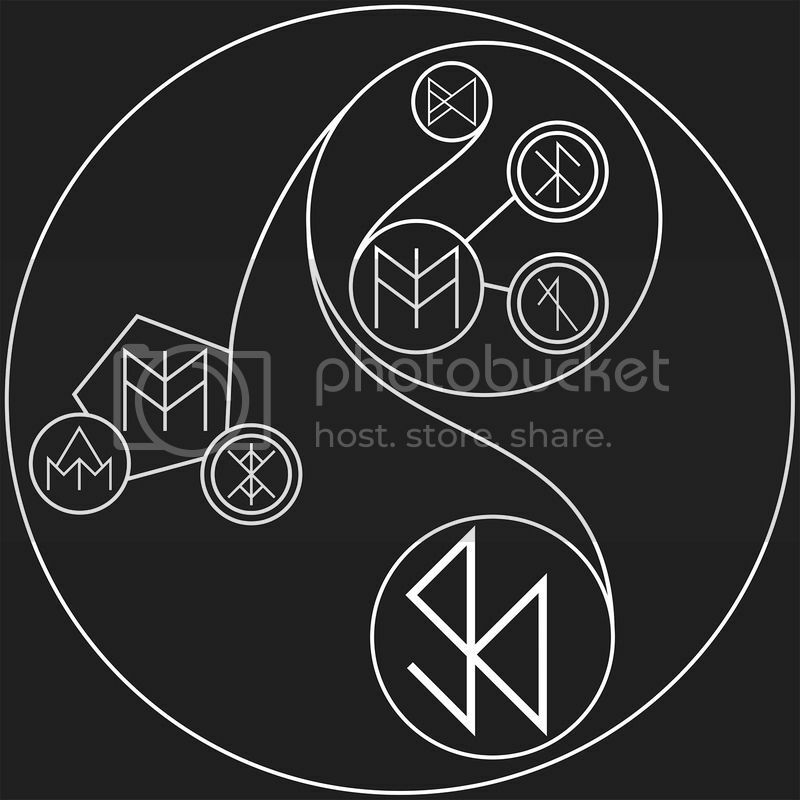 As powerful as the Invert rune is, by affecting time it becomes perhaps the most powerful of all runes, because inverting time does exactly what it sounds like: it makes time run backwards. Playing around with time is about as expensive as it gets when it comes to powering the arrays, and that is why it is so seldom done, but the southerners have found a way around this issue. They only invert time on and inside the human body targeted by this array. It is still costs more energy than turning a man to gold, but far less than inverting time entirely within the containment field. The effect of this is that the human inside moves backwards and any wounds start to knit themselves as time flows backwards. Even musket and pistol rounds extract themselves as they are caught up inside this time distortion. While you can use this to heal cuts and scrapes, the dark southerners use this to bring the dead back to life. That is why the containment field exist, because long after a battle has finished, the southern dead are collected and brought back behind safe lines where they are revived. Since time will flow backwards with this array, the dead would naturally move back to the battlefield before any wound closes, but with the containment field they are kept in place. The result is that it is common practice for the southern kingdoms and empires to have legions they call “the Immortals”, consisting of men brought back to life more times than you’ve had hot meals. These men are killed time and time again, only to be brought back to life in a different place with no memory of the event. Their lives are spent cheaply, but with great effect against the Neoist and Bythikan conquests. When the Jytohan forces discovered the use of this array, they were as appalled and disgusted as they were ready to use it. Militarily it is the most effective weapon one can have, but spiritually? Neoism, Prodigalism and Progenitorism all teach that the soul leaves the body upon death… so does it come back when the dead are revived? It is question for scholars and philosophers, but what can be said is that the few who have thus far been brought back (both soldiers on battlefields and footmen in Middelburg) were changed by the event. They are different now, more distant with less ties to friends and family. To call them soulless may not merely be a metaphor. This week for Magic Mondays we bring you an array to control the battlefield and its enemies around you. Notation: Rotate at a speed of 4 m/s, within an area starting from ten times the array’s diameter to one hundred and ninety times the array’s diameter, Humans and apply the effect of Air, Sound and Light Transmuted into Lightning to Humans. Description: The popular image of a footman is one who skulks around in shadows with a dagger and pistol in hand and nothing else save malice and greed. While the first and last images may be more correct than many would want to think, a footman is often far better equipped than with merely a dagger and pistol. Many carry more weapons and equipment on them than what the government provides soldiers, constables and sailors. One specific type of gear a footman usually carries is premade arrays inscribed on metal disks. When the lead and steel starts flying, there is never enough time and concentration to draw arrays, so having predrawn arrays can save your life. This is how the Invisible Chaos array is used. Inscribed on 10cm wide disks, they effect an area starting one meter out to nineteen meters out. And when activated, everyone within the area of effect is suddenly, and sometimes violently, swung around the array while the air, light and sound around their skin is transmuted into electricity which will keep them stunned and confused, out of breath, blind and dumb. Seen from the outside, once the array is activated, all that you can see is pitch-black shapes tumbling around the array. Like the Riptide array, this is often an array of last resort, used when you are surrounded by enemies and looking for a way out. 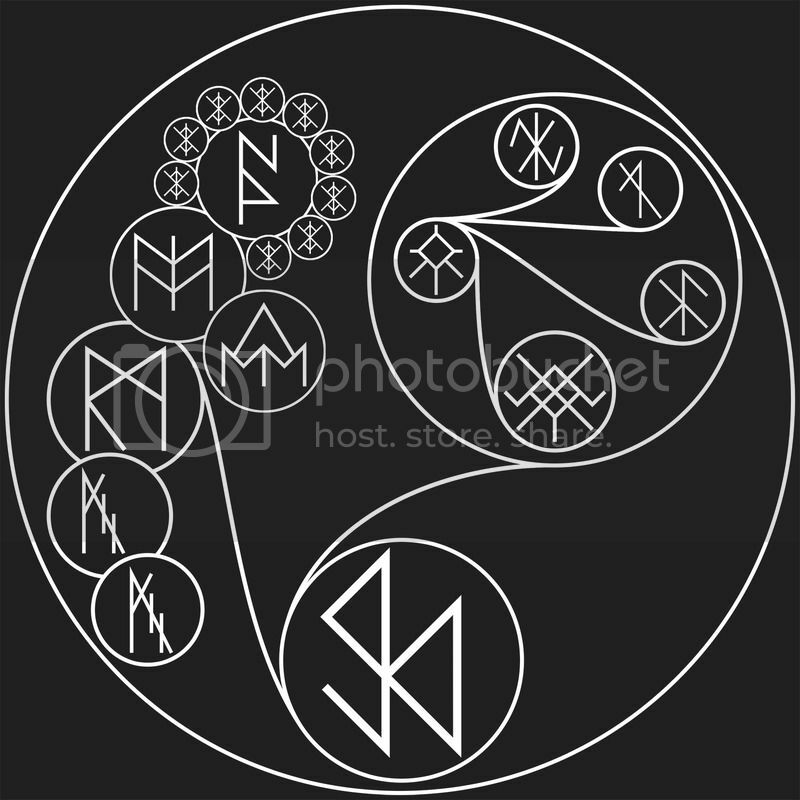 However, there are quite a few footmen that have taken to the new Rotate rune with glee and many times rush into enemies positions to use this array to quickly, quietly and efficiently take out a guarded position while their criminals in arms make their way in somewhere else. The array have become so effective that some constables have even taken to carrying it around to use when they need to control unruly crowds. Download her character pack here. 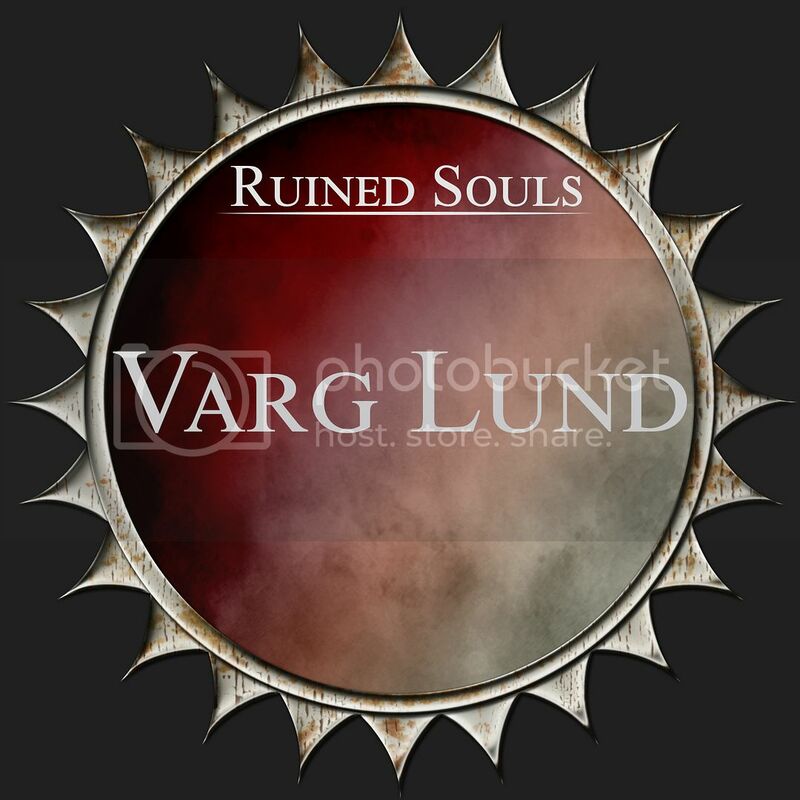 Up this week is Varg Lund, the mad magician from across the seas who meets wizard in forgotten woods and sees visions of the life hereafter.. This week for Magic Mondays we bring you a defensive array that promises to always deliver right on time. This week we show you the Steel Dragon array. Notation: Transmute Copper, Gold, Iron, Lead, Silver, Tin and Wood into a disk of Iron with twice the area size of the array and with a depth 1/10th that of the array’s diameter. Pull this disk towards the array at a speed of 1m/s and Sustain this Pulling. Description: “Protection when you need it, only when you need, every time you need it,” was the marketing phrase the Uttosians used when they brought the Steel Dragon across the eastern ocean to Alfresia. Using the runes to fashion this type of array was entirely unorthodox according the Alfresians, who preferred something more reliable and rather less tangible than steel plates protecting them from incoming musket fire. There is a reason why the Middelburg Standard is the most used defensive array in the city. After all, what can penetrate an impenetrable force field? “Whatever the arrays do not specify,” was the Uttosians answer to that rhetorical question, and suddenly the Alfresians weren’t so stalwartly sure about their tried and true array. 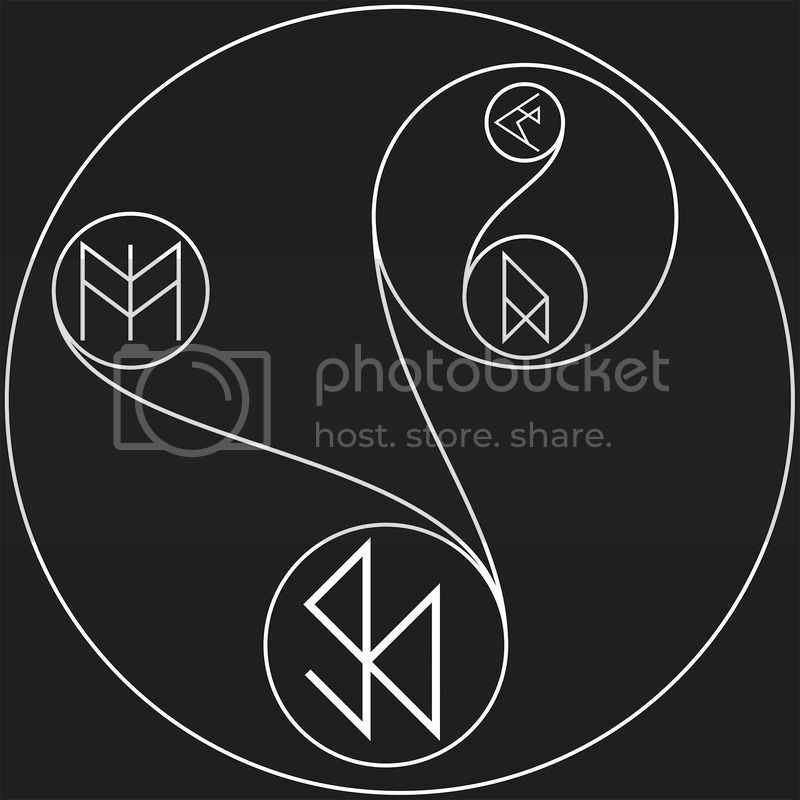 It is undoubtedly true that the Middelburg Standard, as all such arrays do, only stops materials which are specified by the runes in its array. Ice, for example is not specified and that is why, to this day, “ice knives” are (seldom) used in assassinations. What the array makes up for in simplicity, it loses out in flexibility. “Dragons are as flexible as they are strong!” the Uttosians claimed when they heard of this revelation by the Alfresians, and there is some merit and truth in their propaganda. The Steel Dragon does create the steel disks (or Dragon Scales) only when confronted by the materials listed, similarly to the Middelburg Standard‘s force field it is true, but that scale is then held against the array by any lingering energy, ready to intercept any impact from any sort of material. Once it has been primed, it leaves behind a set of armour ready to defend its wearer. To increase the flexibility of this array, the Uttosians who venture into Middelburg often carry pouches of gold dust with them. If ever confronted with an enemy, they simply have to reach into their pouch and cover themselves with the dust and like a parlour trick, they will suddenly have become encased in a set of dragon scale armour! There is a reason why the Middelburg footmen call the bodyguards of Uttosian diplomats Wyrms, because like the fabled creature they can suddenly appear in flash of golden light to rip apart the unwary. The Ruined City, is an excellent campaign and a great source of adventures, both randomly encountered and planned, however there are far more to the The Runed Age and the Grand City of Middelburg than just one campaign. And so we will be giving you Quest Giver Fridays, where we take one of the many factions in Middelburg and adjust the Adventure Generator in the Runed Age Corebook to them to give you more varied and unique missions and jobs to do in the city. 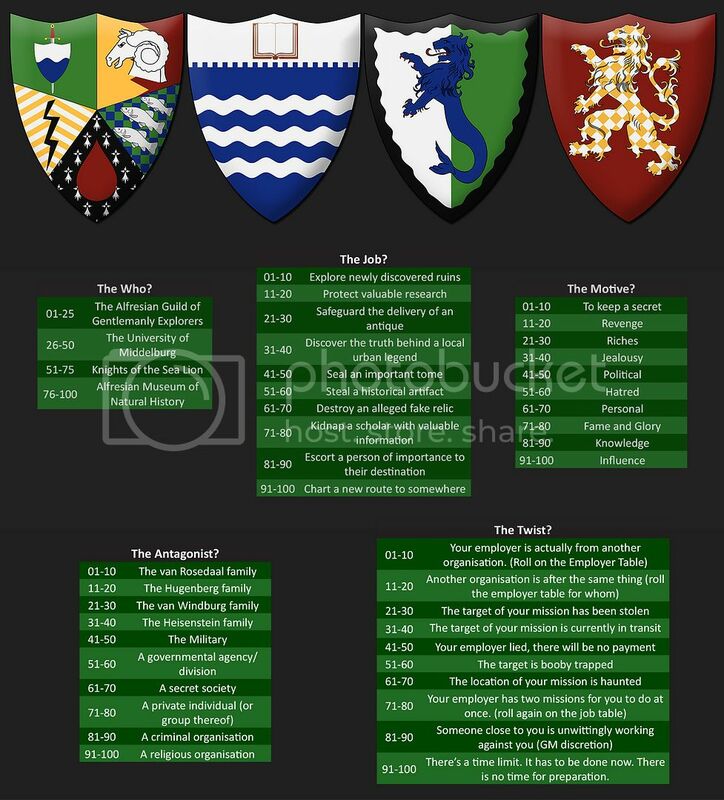 This week we bring you the military organisations, because lets face it, sometimes all you want is a jolly good fight. While there are still a variety of missions to do and the organisations come in a few variety of flavours, you know that taking a job from the military means you will end up battered, bloodied and bruised by the end of it. And while these missions will be dangerous and some of you might not make it out alive, for those that do you will be far richer than you were yesterday. You know that if there is one thing no government hesitates to spend money on, it’s the military and if there is one thing the military likes doing, it’s outsourcing its most dangerous missions to mercenaries whose lives don’t matter. So dangerous? Yes. Lucrative? Even more so. As with the different temples and religions in our first Quest Giver Fridays, the type of employer you get here will have a dramatic influence on the flavour of the mission. If your employer is the 6th Brigade, you know it will be a land based mission, and most likely a slog fest; if you get the 2nd Fleet, you know it will water based mission; with the 1st and only Airfleet, you will be perilously flying over Middelburg trying hard not to fall to your deaths. The two mercenary employers give a bit more variety in their demands, but in general the Golden Talons focus more on small teams, land based missions while the Triton Wolves are bombastic and on the waves. So it’s not simply what you are doing that will colour your job, but who your employer is. 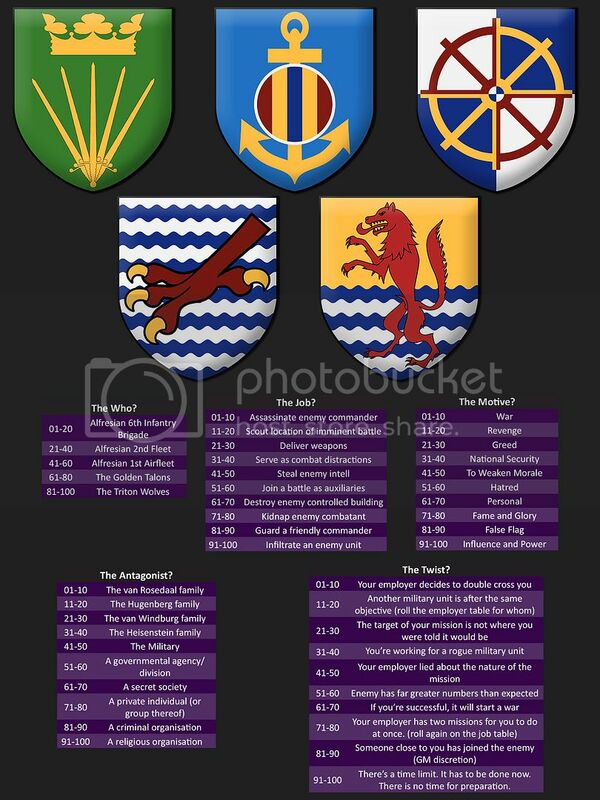 The five coat of arms are (from left to right): The Alfresian 6th Infantry Brigade (also known and the Home Guard), the Alfresian 2nd Fleet (also known as the Sitting Fleet), the Alfresian 1st (and only) Airfleet (known as the Sky Chasers), the Golden Talons (mercenaries of the Merchant League), and the Triton Wolves (Tolian Mercenary Privateers). 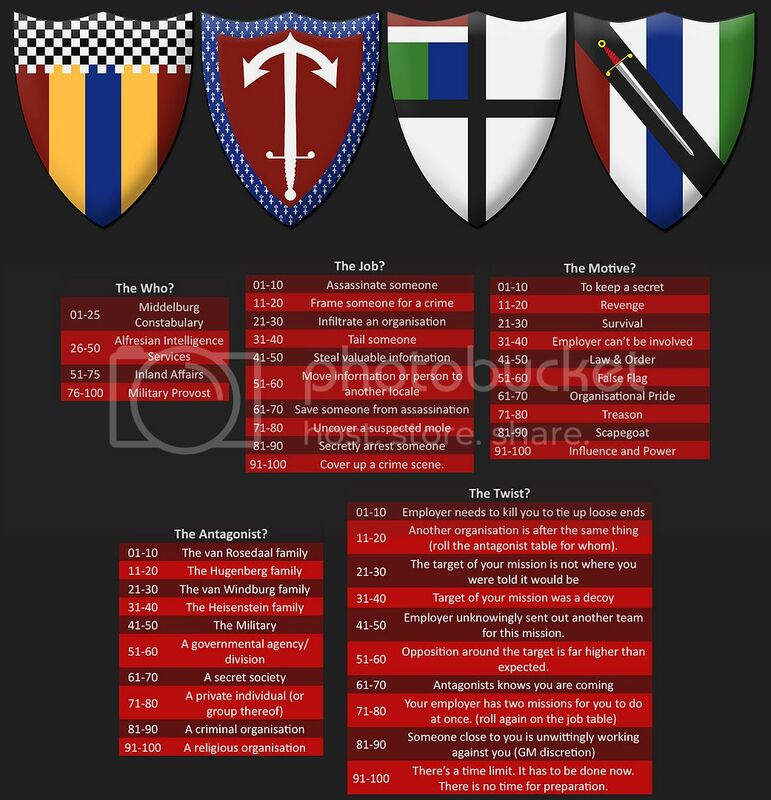 If you want to know more about them, all of these factions are described and discussed in The Runed Age Corebook and The Ruined Adventure Books that you can get from DriveThruRPG. Up this week are the organisations that deal with exploration and learning! That’s right, life in the dark streets of Middelburg is not just all about killing and dying, or about who has the biggest rifle or sharpest blade. No, sometimes there is a lot to be learned on the streets of Middelburg, that is, if you know where to look. There is a simple rule in Middelburg: eventually, everyone needs a criminal. Whether it is, as we’ve seen in the past few weeks, the temples, the constables or even the university and museum, eventually everyone needs to do something that may not be 100% legal, moral or ethical, or they simply want to make sure no one hears about it. So when that day comes, even the most noble, the most educated among the city’s population will turn to footmen to get the job done. That is not to say that you will be getting the same kind of jobs from these vaunted institutions as you would from, say, the Merchant League. The sort of jobs you’ll get from these organisations of exploration and learning are far tamer than the dangerous streets of Middelburg and may simply just involve sending you out to explore some ruins, chart a new map somewhere or even deliver a priceless antique. But while the jobs may appear safer, remember that for scholars, the pursuit of knowledge is its own reward and that means you may end up poorer at the end of a mission than when you started. The four coat of arms are (from left to right): The Alfresian Guild of Gentlemanly Explorers, The University of Middelburg, The Most Noble Order of Knights of the Seal Lion, and the Alfresian Museum of Natural History. 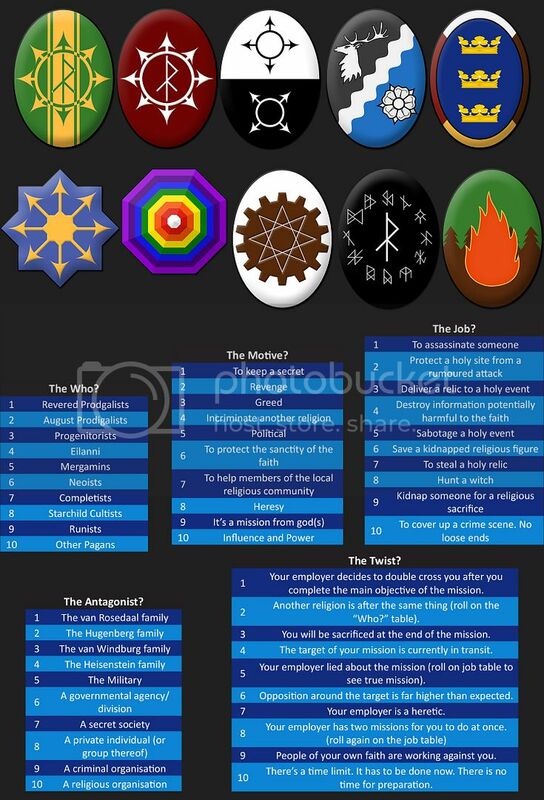 If you want to know more about them, all of these factions are described and discussed in The Runed Age Corebook and The Ruined Adventure Books that you can get from DriveThruRPG. Up this week are the Law Enforcement Organisations! That’s right, no matter how gruesome or debased a criminal you are, you will always find employment with law enforcement. There’s always something they can’t be seen to do, something that would be illegal for them to do, or something they just need a criminal’s expertise for. Whatever it may be, always keep an eye on your back when working for the law, because at the end of the day they are still the law and you are still criminals and they won’t lose any sleep if they arrest you. On the other hand, you might think of yourself as a righteous vigilante, going where the constables can’t and doing what they are unable to do. In that case, you could do worse than working for the law and building a strong rapport with the establishment. After all, they might arrest you, but they won’t stab a dagger into your back like criminals will. Working clandestinely for the law can be a safe and stable career, but the law never pays as well as crime do. The four coat of arms are (from left to right): The Middelburg Constabulary, the Alfresian Intelligence Services, Inland Affairs and the Military Provost. If you want to know more about them, all of these factions are described and discussed in The Runed Age Corebook and The Ruined City Adventure Book that you can get from DriveThruRPG. We stay in the sky this week with the very array that sent men tumbling through the clouds in the first place. Notation: Create a Containment field ten times as wide as the array with a depth a tenth of the array’s circumference that excludes Air if Air is present. Apply the effect of negativing gravity on Wood to this Containment field. Description: Its notation is quite a mouthful and it certainly isn’t the prettiest thing around, but then the most practical of things never are. The First Steps array is counted among the oldest of arrays still in use in Alfresia and around the world and for very good reason: it works remarkably well. Runesmiths and Runecrafters predominantly follow the philosophy of “if it isn’t broken, don’t fix it” and while this may stifle innovation, it has meant the First Steps has served humanity well for over fifteen centuries. In saying that, it is only in the last two years that this array has come into its own and went from a half forgotten dream to one of the most valuable arrays in the world. The reason for this is simple: First Steps require a phenomenal amount of energy. What it does is create a containment field around the ship’s hull that negates the effect of gravity on it (or at least the wooden parts of it) making it nearly as light as a feather as well as destroying all air that comes close. All of this means is, when this runic containment field is active, that the airship floats through the air almost as if through the vacuum of space. There is nearly no weight to it and there is no drag and air resistance. It makes airship travel quick and efficient (and therefore desirable), but it takes a monumental amount of energy negate the effect of gravity on nearly an entire ship for the whole duration of a flight as well as destroying how many thousands kilolitres of air that the ship passes through. For the fifteen centuries this array existed, it has worked… technically speaking. It did, as still does, exactly what it is meant to, however there has never been a reliable enough power source to feed this array until the discovery of the Lightning rune and the invention of the runic batteries. Before this, folks had to precharge these arrays with heat and light and hope that the arrays held enough energy for the entire trip. More often than not, they didn’t, and so the proto-airships fell from the sky one by one until it was unanimously, and unspokenly, decided by everyone with more than two braincells that airtravel was too dangerous… until the Lightning rune changed all that. Now, the race to conquer the skies has begun and already there are dozens of airships sailing on the clouds above Alfresia. This week we conclude our series of character sheets looking at the Inhumans who began the Great War nearly 2000 years ago. There are six Inhuman species and this is the sixth one, but we left the best for last! When playing as the Inhumans, remember that the runes and arrays were given to humans only, meaning that while the Inhumans could draw and use the runes, there wouldn’t have been much of a chance to do so when they were at war with humans. Also keep in mind that only human blood can activate the arrays (other than energy and orichalcum of course). Inhuman blood has no effect on the arrays just like animal blood. So lastly this week are the Riusdyr! The Riusdyr, also known as the Ogres, are the last remaining Inhuman species on the planet. This is because they allied with us humans (or rather we humans bribed them to ally with us) during the Great War nearly 2000 years ago. As a reward, we didn’t slaughter them all during the Great Purge as we did the other five Inhuman species. However, time is a cruel mistress, and poaching and hunting have made the Ogres a critically endangered species. As you can see, the Ogre’s character sheet is a bit special, and that is because you can play as an Ogre in The Runed Age even if you didn’t want to retread the steps of the Great War. So we made it as true to the Ogres as we can. As you can see, with a Constitution Skill going from 100 – 200, there are a LOT of wounds. That is what makes the Ogres so dangerous is combat, they can soak up any amount of damage and still keep going. To go with all these wounds, the Ogres have a natural armour rating of 30 on all Hit Locations. This is because they can’t use the runes and arrays, meaning they have no Sigils to spend. So to make up for that, we made them even tougher. It is their strength which defines them and that is why they have the two Skill Specialisations. They are not the quickest things on the planet and therefore they don’t have a high Athletics Skill, but there are few things stronger than they on the planet. Similarly, they are not the best in combat, but if they do connect with you, you will not survive. Some excerpts from The Runed Age Corebook about the Riusdyr. Posted on March 25, 2016 May 12, 2016 Categories Character Sheets, Lore, UncategorizedLeave a comment on Inhuman Fridays!